Recently I’ve focused on utilising the command line more whilst learning how to use Git outside a GUI. Through this I’ve found what can only be described as the ultimate code review command!! along with an approach I like for assessing changes. Most of the time code reviews can feel overwhelming, especially as branches get larger and diverge further from the develop branch, and to be honest it tends to be easier to sit down with the developer and have them highlight where to focus your attention rather than trawl through days of bug fixing commits. 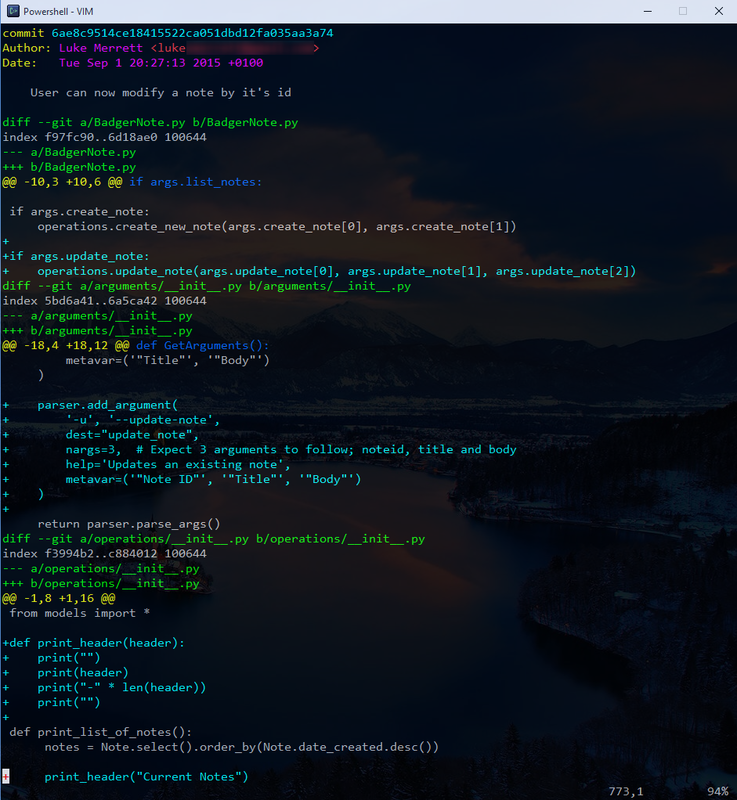 However if your the anti-social sort; or, like me, get a warm fuzzy feeling when rocking the command line; here’s a guide to the ultimate code review git command. Scott Hansleman wrote a setup article about it a while ago that still works nicely with the latest version; see here for his install guide. VIM? That’s right we’re going proper poweruser / geek today. I say VIM as it integrates very nicely with Console2. Sure it takes time to learn the shortcuts; but for what we’re about to do it’s perfect. Then add VIM to your system path variable and you’re good to go on the command line. Open up Console2 with a Powershell tab. If you’ve just added VIM to your path I recommend restarting Console2 so the path variable is refreshed. I find it immensly useful to go through a filtering list of commits in the order they were made; whilst VIM does a great job of highlighting the differences (it syntax highlights the diff automatically). This will output all commits not merged into origin/develop with the same output style as above. It’s a bit easier to use as you don’t have to add author or date.